In today’s pass-happy NFL, having that elusive “Quarterback of the Future” is perhaps the biggest difference between haves and have-nots. The successful teams, the playoff teams, exhibit varying philosophies and talent disparities across the field, but all of them have a quarterback that they are counting on keeping for years to come. Want to see the big difference that having that “QBOTF” makes? Just take a glance at the order of the NFL draft, shown below right. You can take issue with my individual assessments. Maybe Seattle and Jacksonville don’t really have absolute Quarterbacks of the Future, maybe Cleveland does. But the trend overall is clear. In order to be a playoff team at all, your quarterback position ought to be rock solid now and for the foreseeable future. Ben Rothlisberger vs. Aaron Rodgers only illustrated that point on Super Bowl Sunday. Furthermore, only two teams picking in the top ten, Dallas and Denver, have found a quarterback to hitch their franchise to (and Tim Tebow may not even be that guy for the Broncos). Everyone else is lost, and they will stay lost until they find someone to lead their team. All of this is interesting, but for the Eagles it’s of great importance. They are the only team in the league with more than one franchise-caliber quarterback. Michael Vick’s 2010 heroics make it practically automatic that the team will keep him around for the long haul. 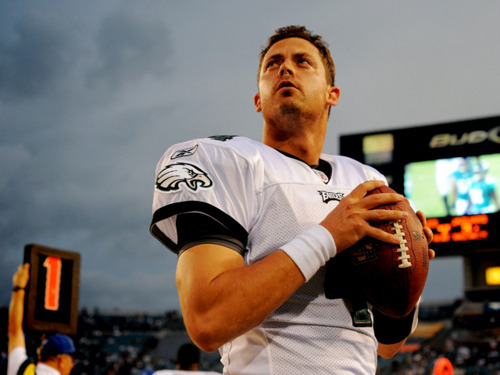 But Kevin Kolb has proven to be no slouch. He could easily start for all 11 teams on this list without a QBOTF. And unlike last year, when the Eagles put Donovan McNabb on the open market, the quarterback isn’t viewed by many in the league as a declining veteran. Kolb, despite his limited experience, is only 26 years old and thus has tremendous upside. He’s the same age that Matt Schaub was when Atlanta traded him to Houston for two second-round picks and a first-round swap (because Schaub was also blocked by Vick). And Kolb’s a year younger than Rodgers, the newly crowned Super Bowl MVP. So while last year teams like St. Louis preferred to go with the drafting-a-quarterback option, more teams looking for long-term solutions this year will be willing to look at Kolb as an alternative. That’s why we have already starting hearing grumbles about Kolb already in demand in places like Arizona. Basically every team marked with a “No” on the chart will be at least considering the option — especially if they miss out in the draft. While the trade process is complicated this offseason by the lack of a new collective bargaining agreement, eventually one of these teams will be willing to pay a substantial price to make Kolb their Quarterback of the Future. NFL executives know that without one, they’re doomed to continued failure. Tagged with Philadelphia Eagles, Kevin Kolb, Trade, Trade Market, Rumors, Michael Vick, Quarterback, NFL Draft, Offseason, Passing Offense, Donovan McNabb, Matt Schaub, NFL. February 8, 2011 by Brian Solomon.